After a whirlwind weekend where we uprooted friends and family from all over the world to visit us for our Williamsburg wedding, you would think that my new husband, Tod, and I would be ready to sit back and relax on our two-week honeymoon - but not us! We were really looking for history and beauty, new experiences, and new stamps on our passports. But at the same time, I wanted my worry-wart of a husband to be able to enjoy it stress-free. I thought to myself, good luck finding that combo. After discussing all of the places we'd already been and then the places we've always wanted to go, we decided that Greece was an absolute must. One of our groomsmen is Greek and travels there often to see family, so, of course, we consulted him. However, after talking to him about Athens and all the potential islands, we were even more perplexed over where to go than we were before. 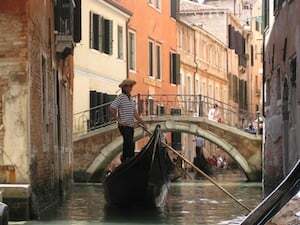 Finally, we started looking at cruises and decided on a 12-day Mediterranean cruise on Princess Cruises that started in Venice and ended in Rome. As a very generous wedding gift, and because he was spared the cost of the wedding due to my and Tod's adamance that we foot the bill, my father purchased our flights and cruise. After this $7,000+ burden was lifted, we put everything else on our Travelers Joy registry. From cab fare to bottles of champagne to full cruise excursions, there was no limitation! We also loved that Traveler's Joy worked alongside the I Do Foundation, which drove us to really fill our registry in order to maximize the donations that would ultimately go to our local SPCA. We had almost as much fun completing the registry as we did on the trip. Well, almost. The cruise was a perfect fit for us. 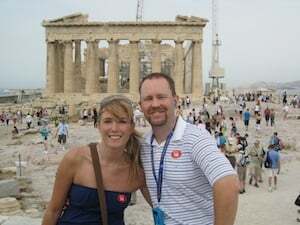 In addition to Athens, we visited multiple Greek islands, just as we'd hoped. But we also had the peace of mind of unpacking only once and having the security of a "home base" on the ship. Being a frequent cruiser, though, I had certain expectations for the cruise itself, but quickly discovered that the usual Caribbean cruise features that I'd come to expect (pool parties, rowdy piano bars, etc.) weren't very practical for people that spent 11 out of 12 full days actively sightseeing some of the world's most exciting cities. However, winning the Newlywed game, getting semi-hypnotized (although Tod swears I was fully under), and enjoying our very first couple's massage in an above-deck cabana were wonderful ways to unwind at the end of some very long, but thrilling days. As an added bonus, in addition to Athens and five of the Greek islands, we also visited Dubrovnik (Croatia), Kusadasi (Turkey), Venice (Italy), Rome (Italy) and a place on both of our bucket lists: Pompeii. After hiking up the daunting and still-active Mt. Vesuvius, we made our way down to the infamous city it buried. We admit it, we went to Pompeii with the main purpose to see the "plaster remains" (for lack of a better term), but found ourselves more interested in the seemingly mundane details, like the markings from an old store gate or stepping-stones in the street. And it wasn't because the remains weren't fascinating, but the rest of the city was just that remarkable. We did, however, find the Pompeiian brothel quite jaw dropping as well and tried our best not to point and giggle like teenagers at the "artwork" on the walls. Our very serious, but very knowledgeable, self-named tour guide, "Mommy", would have certainly frowned at that. Santorini was another location that drew us in for one amazing feature, but really captivated us with another. While most travelers already know that Santorini is this beautiful and unique island with historic cities that sit upon a steep ledge in the Mediterranean, the story of how it became this way really fascinated us. 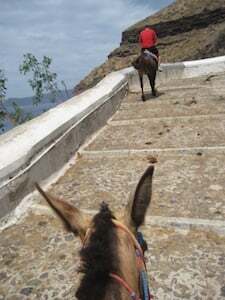 A result of this giant blast is a steep ascent to island's main cities and we traveled the 588 steps to the top the only way a first-timer should - by donkey! While Tod's donkey took off well ahead of mine (the donkey knew nothing of chivalry, apparently), I was able to appreciate the panic of the girl next to me as our donkeys clung frighteningly close to the edge of the stair wall. The stair wall was tall enough to keep pedestrians safe, but from the back of a donkey, you were very aware that nothing more than your feet was below the crest of that wall. By the time we reached the top, we were ready for a glass (or bottle at that point) of wine, so we sat down and enjoyed two Santorini specialties: Vinsanto wine and tomato pancakes. Sitting at one of the cafes overlooking the bay from 1,000 feet up was one of the most breathtaking and peaceful views we've ever enjoyed. Of all the ports, though, on this 12-day trip, we were most surprised by Rhodes, Greece. We decided that if we were ever to travel back to Greece for a longer visit, Rhodes - one of the two ports we had the least initial interest in at the beginning - would be the best place to return to. It had everything! The destination had an old city filled with history, a newer city full of shops and trendy items, beaches and water sports, a casino and, if that wasn't enough, you could rent a motorbike right at the port and explore the rest of the island. Of course, the fact that we had one of the best gyros ever and our first taste of ouzo there didn't hurt our opinion either. 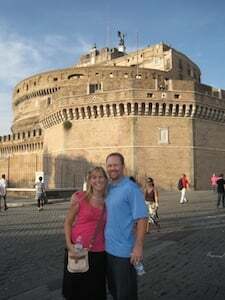 Finally, since Tod had never been to Italy, we stayed an additional two nights in our debarkation port city of Rome. Even after going to Rome in 2002 with my family, I was thrilled to go back. We stayed at the Hotel Palladium Palace which was recommended by Tod's mother who had been there two years prior. After our visit, we clearly understood why she loved it. The hotel upgraded us to the honeymoon suite with a Jacuzzi tub that I couldn't pull Tod out of after walking laps around the city. As fans of the book Angels and Demons, we took an "Angels & Demons" walking tour with Eternal City Tours. Our guide Bruno was a human encyclopedia of Rome and taught us more than we ever expected. We also tried our luck at the metro in Rome so we could visit the catacombs. After a lot of walking, riding the metro and a few bus trips, we finally made it. Of course, I think the experience of getting lost in such an amazing city - where people live among 2,000-year-old relics as if it were a Starbucks - was the best part of that adventure. After Rome, though, we were finally "whooped" and ready to get home to get some rest. All in all, after receiving $3,000 in gifts (and my dad's present, of course) from friends and family, we enjoyed two full weeks in Europe, taking excursions in nearly every port, toasting to our marriage with rivers of wine, eating some of the best food imaginable and seeing some of the greatest sites in the world, all for about $200 out of pocket... total! In fact, our friends were so impressed by this that two more couples have since used Traveler's Joy for their wedding registry. Our Traveler's Joy registry really allowed us to take full advantage of this rare opportunity and we now have memories that will last a lifetime.